A few weeks ago, after attending a Pinellas International Council event, I stopped in at the Train Station. I have loved this building since moving to St Pete 11 years ago and am so happy that it is being used for such great things. I absolutely love this quote from Keep St Pete Lit’s website, “Do you read? Do you write? Do you live in or around St. Petersburg? Well then, welcome to Keep St. Pete Lit, where we celebrate and promote the area’s literary community. Whether you’re a writer, a reader or just love the arts, we want you to help us Keep St. Pete Lit. Read and Write on, my friend!” I come from a family of writers, avid book readers, former book reps and bookstore managers. My biggest moving expense is always books & records! Keep St. Pete Lit wants to instill a love of reading, writing and storytelling in all generations in the Sunshine City but now has special programs for the younger generations. Keep St. Pete wants to help children find their creative gifts with a new week-long summer camp. The organizers behind the camp want to ensure that this opportunity is open to all children and families interested. So Keep St. Pete Lit is offering two Creative Writing Summer Camp tuition-free for low income families at the Morean Center for Clay. They’re accepting 15 students each week ages 9-12. To help cover the cost of teacher’s salaries, supplies and rent, KSPL launched an online fundraising campaign. So far, they’ve raised $745 of a total $3,000 goal. A $100 donation sponsors one child. 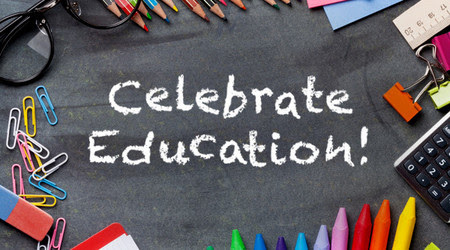 The National Education Association (NEA) describes National Teacher Day as “a day for honoring teachers and recognizing the lasting contributions they make to our lives”. The NEA gives a history of National Teacher Day: The origins of Teacher Day are murky. Around 1944, Arkansas teacher Mattye Whyte Woodridge began corresponding with political and education leaders about the need for a national day to honor teachers. Woodbridge wrote to Eleanor Roosevelt, who in 1953 persuaded the 81st Congress to proclaim a National Teacher Day. NEA along with its Kansas and Indiana state affiliates and the Dodge City, Kansas local NEA branch lobbied Congress to create a national day celebrating teachers. Congress declared 7 March 1980 as National Teacher Day for that year only. The NEA and its affiliates continued to observe Teacher Day on the first Tuesday in March until 1985, when the National PTA established Teacher Appreciation Week in the first full week of May. The NEA Representative Assembly then voted to make the Tuesday of that week National Teacher Day. Massachusetts sets the first Sunday of June as its own Teachers’ Day. Today, Thursday, April 27th, 2017 is the 24th anniversary of Take Our Daughters and Sons to Work Day. Over 40 million parents and kids will go to work together, giving boys and girls real-world career education to help them plan their future. Here’s to celebrating our youth and their bright futures! This is the first time that most girls and boys will be asked to talk about how they envision their future home and work lives. For some participants it will be easier to start these conversations in a group comprised of their own gender. For this reason, we recommend separating the girls and boys for the first few activities. After girls and boys have a chance to articulate their ideas, it will be easier to come together and share them. Are you a REALTOR who deals with international real estate and want to build “global” business skills? Then you need to attend this class! Please join us on Thursday, February 2nd from 8:30 to noon. * Become familiar with cross-border issues whether they are related to language, culture, law or just plain common sense. Every real estate agent wants a well-informed home buyer who’s prepared to take on the responsibility of home ownership. Of course, not everyone is enlightened about the homebuying process when they seek your services. One way to get your clients ready for the transaction is to refer them to homebuyer education courses before they launch their search. What’s your neighborhood school’s grade? There is a clear connection between the quality of schools and the value of the homes near them. Families want to raise their children near good schools. Sometimes though, it can be difficult to differentiate which schools are considered “good schools.” One resource available to you is the annual report released by the state of Florida. This report grades all public schools on performance, and the state has made the results public at http://schoolgrades.fldoe.org. The state releases this important data annually, but usually after the school year starts. It may be too late this year to make any changes for your family, but there is always an opportunity to get involved, or move to a new school next year. Remember, a key factor for the success of our schools is volunteer involvement. Every school has opportunities for parents, and non-parents, to contribute. Kids need mentors and coaches, someone to help make them a healthy meal or put a band-aid on a cut. In the end, community involvement in our schools makes them better, and in turn, keep our neighborhoods and home values strong. Grades are for 2015-2016: Each school grade consists of data compiled from that school year. Historic performance data is not considered, so past success does not influence current grades. To be fair, an “A” rating is very difficult to achieve. Only three school systems in the state attained that status this year. What if your school’s grade is a “D” or “F?”: That’s not good, but don’t lose hope! State and local governments use the data to guide policy and steer resources to the places of most need. And to date, this policy has seen success. This year 58% of last year’s “D” and “F” schools improved at least one letter grade. While this is not a complete turnaround, they are now on the path to being great schools. Pinellas County: Three of the five schools spotlighted in the Tampa Bay Times “Failure Factories” series improved. They still have a way to go to be on par with the county’s overall status a “B” county, but things are getting better. Pinellas County received an overall rating of “B” for school year 2014-2015. Pasco County: Unfortunately, Pasco County schools on the whole underperformed compared to 2014-2015 going from a “B” district to a “C” rated district. Several schools did see some improvement, but overall, not a banner year for Pasco County Schools. Hillsborough County: Like Pasco County, Hillsborough County saw some regression going from an overall “A” rating to a “B.” While still a strong school system, any step backwards is unfortunate and requires attention. It is important to understand how our schools can impact neighborhoods and our real estate. Know that I work to stay informed about issues that affect property rights and values and will keep you informed as well. You can find out more at schoolgrades.fldoe.org. If you ever have questions, you can email me at AnnalisaWeller1@gmail.com or call me at 727-804-6566. The following museums were found on several lists as the most visited in 2015 around the world. I was quite surprised to find out that I have visited 7 of the 10. My travels have not brought me to Asia yet so that removes Numbers 2, 8 & 10 for me. Better get to work on that! My daughter just returned from China so “we” could use the familial visits to check off another one on the list-not really. I would, however, like to add the National Gallery of Art in Washington, D.C., which opened in 1937. As I a child I was lucky to live close to DC & so we visited it quite often. Last year while in Washington, DC for business, I spent the afternoon in the National Gallery of Art with my family. As I turned the corners, I would get a glimpse of some of my favorite works of art & felt like I was seeing dear old friends-Renoir, Monet, Manet, Degas, Cassatt, Cezanne, Picasso, Van Gogh, Fragonard, da Vinci and more. They make me so happy & speak to my soul. Another wonderful museum is the Salvador Dali Museum in St Petersburg, Florida which houses the largest collection of Dali’s works outside of Spain. Not only are the paintings & sculptures fascinating but so is the building. Stanford University in Palo Alto, California has a wonderful collection of Rodin sculptures in a garden setting that is definitely worth checking out. So get out there and appreciate the beautiful things in life! Tell me which are your favorites. 8.7 million visitors in 2015. 7.3 million visitors in 2015. 3. National Museum of Natural History in Washington, D.C.
6.9 million visitors in 2015. 4. National Air and Space Museum in Washington, D.C.
6.8 million visitors in 2015. 6.3 million visitors in 2015. 6 million visitors in 2015. 5.9 million visitors in 2015. 5.3 million visitors in 2015. Some Stetson students returning to college life in August will find themselves enjoying the cottage life. Other students will be welcomed by larger, cooler and “greener” residences, flood-free parking on the west side of campus, and the new Marshall and Vera Lea Rinker Welcome Center. All are part of construction and renovation projects scheduled to be completed before students return to campus on Aug. 19. * WELCOME: The new Marshall and Vera Lea Rinker Welcome Center – a three-story, 28,000 square-foot complex in the middle of Stetson’s historic district – will welcome prospective students and alumni, and will centralize a number of services for current students. The facility will house the Office of Admissions, Career and Professional Services, Student Financial Planning and the Registrar and Bursar’s offices. The university is calling them “cottages” to reflect their ambience, Allen said. The four cottages include residences at 205 E. University Ave. (which will house four students), 220 E. University Ave. (seven students), 245 E. Michigan Ave. (five students) and 208 E. Pennsylvania Ave. (seven students). One of the cottages will be used by the Lambda Chi fraternity. “We will go through the houses and renovate and spruce them up as needed, as well as furnish them,” Allen said. Residency at the cottages is based on student seniority. Colonial Oaks, at 275 Stetson Ave., will house 48 students. Stetson House Apartments, at 285 Stetson Ave., will house 36 students. “We completely refurbish our apartments when we buy them,” Allen said. Renovations include new roofs, air conditioning, plumbing, flooring, bathrooms and more. More student housing will be available at Plymouth Apartments, which the university is leasing. Those apartments, at the corner of Plymouth and Amelia avenues, were fully renovated before being leased, Allen said. * GOING GREEN: The new metal roofs going atop Flagler Hall, Sampson Hall and Conrad Hall will be “green” – as in environmentally green. “All those buildings are in our historic district and each one exceeds 100 years old,” Allen said. Because of their location in Stetson’s historic district, the university received a grant for 50 percent of the funding from the state of Florida. 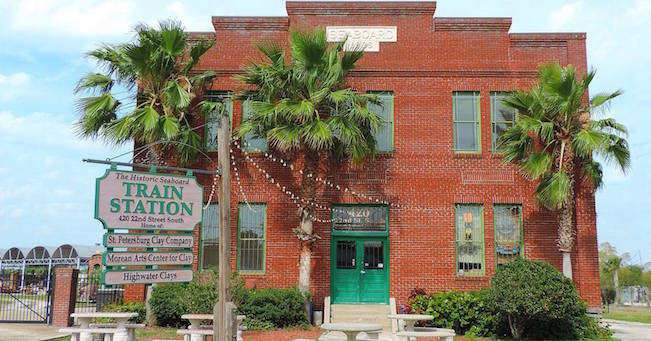 Also, the project “is fully supported by the city of DeLand’s Historic Preservation Commission,” Allen said. The new metal roofs will replace the current shingle roofs. * THE BIG CHILL: The air conditioning system that serves the bedrooms in Emily Hall is being replaced. Emily Hall houses 220 second- and third-year students. The air conditioning in University Hall is being “enhanced,” Allen said. Also, the building’s bathrooms are being renovated and carpet will be replaced with hard flooring. Carpet also is being removed from Conrad Hall and Chaudoin Hall. The change will help in the fight against allergies, Allen said. “By the end of this summer we will no longer have any carpet in any of our resident hall rooms,” he said. * RAIN, RAIN, GO AWAY: West side parking, which includes 100 spaces used by commuter students, faculty and staff, is going to lose its reputation as a flood zone. The parking area is behind what is now the HR Building as well as Allen Hall, Wesley House and Cummings Gym. “Rain water just races across the parking lot and across Minnesota Avenue, floods Minnesota and then floods the other parking lot,” Allen said. “We’re going to create storm water retention ponds” to alleviate the problem. The university will work on the project with Wesley House, a United Methodist campus ministry.